In my last blog I said “My take is there are very few Bulls with conviction at this point in time to provide a strong rally. So the conclusion is that some outside powerful surprise EVENT is all they can hang their hat on…” and sure enough we got that event today! U.S. stocks bounced higher for a second day this Tuesday morning, with investors drawing a psychological lift from billionaire investor Warren Buffett’s proposed buyout of municipal bond insurers’ liabilities and another round of cost-cutting by auto giant General Motors Corp. Billionaire investor Warren Buffett is offering to help out troubled bond insurers by offering a second level of insurance on up to $800 billion in municipal bonds. Just when things were looking a trifle tepid by way of the Bounce Play, this surprise news gave the stock market a 200 point lift first thing this morning. 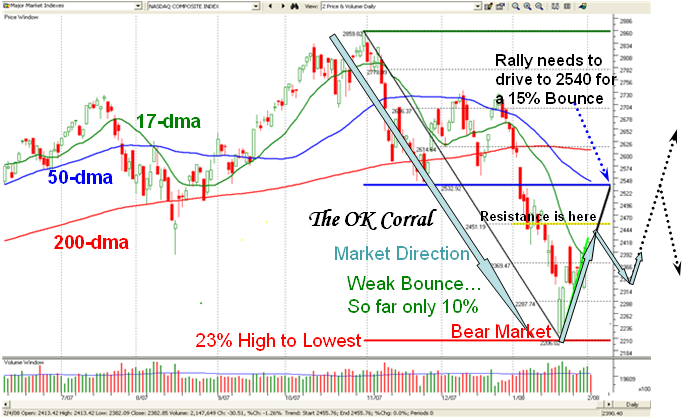 Whether it will hold is another matter, but it is a step in the right direction to get this Market off its lows. Late Breaking News as I go to Press: It held, but it was a disappointing day with the Nasdaq finishing flat and the Large Cap NDX got hit hard after a promising start. It is a trifle discouraging to say the least, when the Market seemed to be shaping up for a further follow through Eureka day to finally finish as a fizzle, giving up the 30 point gain that it had during the day. 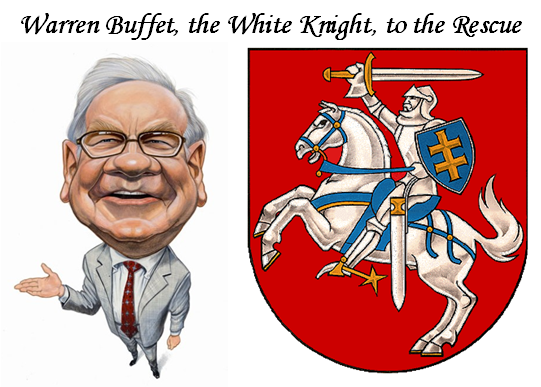 Unless we see immediate excitement by way of “oomph” tomorrow, we can write this bit of news off as a one day wonder and I am sure the Europeans who seemed to take kindly to the Warren Buffet news must be wondering what happened here across the pond. We badly needed a 2% point day for the follow through and all we got on the DOW was half that. Value and/or bottom fishing “dredging” on beaten down Industry Groups such as Home Builders, Financial Groups and some Retail. Growth Bottom Fishing with Fallen Angels on beaten down past leaders who have lost >30%. They include the likes of AAPL, BIDU, GOOG, GRMN and RIMM. Old and Emerging Wolf Packs with Coal the best of the bunch recently, and other faithful groups such as Chemical – Specialty, Steel Producers, Alternative Energy and Gold. Although there have been some excellent short term gains to be made to the upside, the best tactics right now are to play the short term to the upside and take what you can get. Of course, the market will fool you every time as the expected play is another test to the downside in what is still a Bear Market and until the market Internals show us a markedly improved scenario, the retest of the lows is the general consensus. Allen Nevalainen on the Yahoo HGSI bb has been doing intense work around potential upside and downside targets and I see he likes the Measuring Rod (MROD) technique of simply displaying the various levels that come naturally to HGS Investors, so here is the latest update on that picture. He had tagged 1333 as a key threshold for the S&P500 and we seem to be through that barrier for the moment. The “50-yard line” in my OK Corral picture is always a key level especially when it coincides with a key moving average like the 50-dma, and Allen has taken to it as a duck takes to water. He applies that concept to the intermediate rallies as well to show potential swing trade pivot points where the Index must hold for the short-term bias to change. He does good work. At least we have been spared from a rout to the downside for now, and hopefully any retest will abate at or near the Current Base Lows shown in the chart above. Please realize that we will need a 25% return from such levels to just get back to the old high, so that a very strong rally is needed to achieve such a target for the upside when and if we launch a strong rally. Let’s take one small step for the bulls by holding the 200 point gain established first thing this morning, then we can worry about one giant leap for the Stock Market out of this mess. Unfortunately, it was not to be. Best regards, Ian. This entry was posted on Tuesday, February 12th, 2008 at 3:14 pm	and is filed under HGS Principles, Market Analysis. You can follow any responses to this entry through the RSS 2.0 feed. Both comments and pings are currently closed.